Fortunately, we have some incredible options. Despite the ever-thickening traffic in this city, there has never been a better time—nor have we had more of a need—to take time out for an escape. And how lucky we are that we can just hop into a car, drive in any direction from Seattle and find ourselves in a multitude of landscapes. Fall is especially glorious, even here in the Evergreen State. I was reminded of how beautiful it is last fall when I chaperoned my son’s high school marching band trip to a festival in Leavenworth (they snagged first place!). I was in the front seat of a brand-new bus with a wraparound window shield and had a stunning view of the show of leaves, rushing rapids and hillsides along Highway 2. We were there and back in a day, but that little burst of imagery and action was so good for the soul. 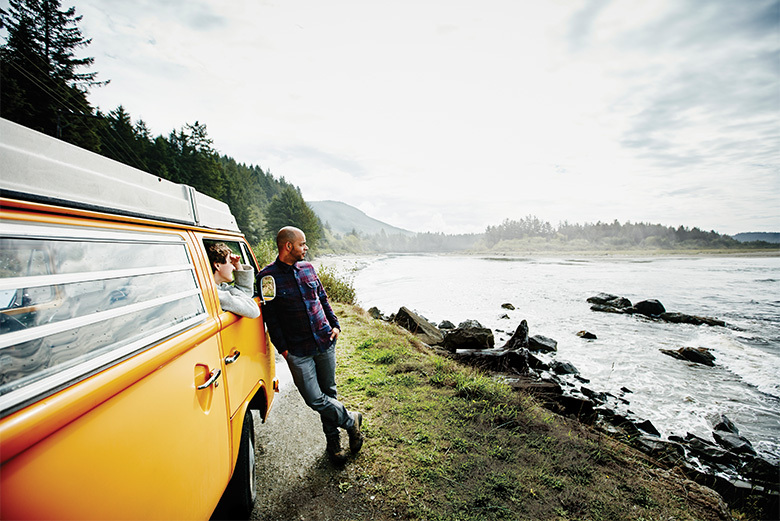 How one takes road trips—the “it’s the journey” part of the saying—can be highly personal. My friend Tom, who wrote about one of his family’s annual epic, weeks-long road trips in our magazine a few years ago, plans detailed, timed itineraries (complete with Dairy Queen stops). Some people like to just drive and see where the road takes them. I fall somewhere in between: I definitely want to know where we are going and have a comfy place to sleep at the end of the day, but I’m also willing, often to the dismay of anyone with whom I’m caravanning, to meander and explore roadside attractions. And then there is the matter of travel companions. Of course, you want your favorite humans along for the ride—folks with whom you can both have great conversations and be comfortable with during those stretches of silence when your mind wanders as you take in the views flashing by. Whatever type of traveler you are, we hope you take us along for the ride and use these pages as your guide, whether you’re up for one of the more ambitious itineraries or merely want to head across town to check out those bubble waffles with fried chicken. Just don’t forget to pull off the road every once in a while to enjoy the view. Some Seattleites eschew this covered comfort, others won’t go without. My favorites are those clear, classic, domed ’70s-style umbrellas to avoid sideways rain. It keeps your umbrella space contained, and its shape helps prevent the umbrella-reverse horror that happens in the downtown wind tunnels—hello, Fourth and Union!. (Public service announcement: These are available year-round for $20 at the Simple Life boutique in Belltown.) If they made a tighter, full-length umbrella body "condom," I would totally buy it. We’ve all heard about the ongoing opioid crisis and we know that many people are addicted to drugs. Still, when some Seattle magazine staffers recently looked out midday from our windows above Fourth Avenue—one of downtown’s busiest thoroughfares—and saw two men sitting on the sidewalk, shooting up, it was somewhat shocking. Even more unsettling: watching the many pedestrians walk by, either oblivious or carefully averting their eyes. It makes Erica C. Barnett’s story in this issue, on the debate around safe consumption sites, especially relevant.